Downloading is not always supported with easy to get to buttons. But look carefully, and you can download these games too! 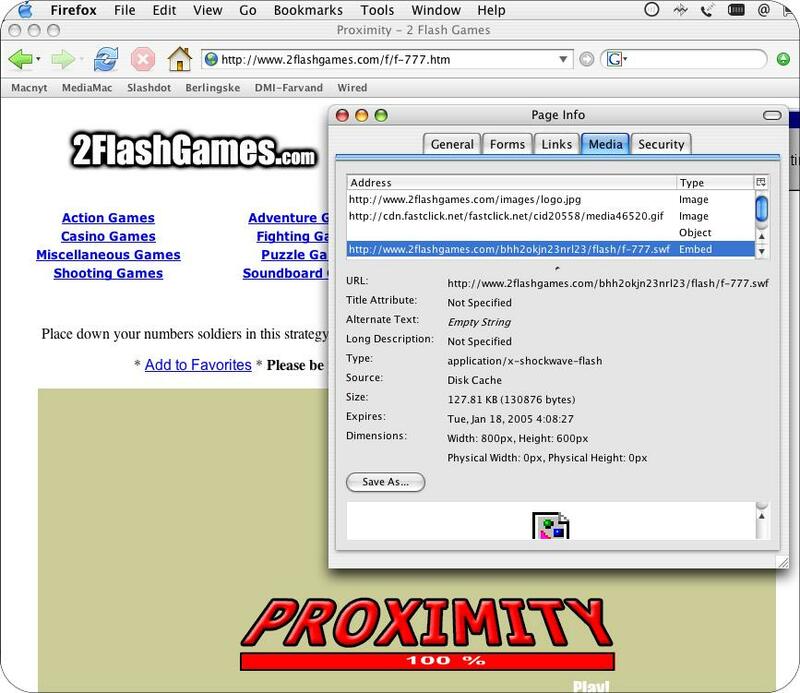 Proximity - here there is no download link. One way to save this game, is to use "File Juicer", and juice Safari's cache from the file menu. (last paragraph of more about .exe files). If you use FireFox, you can save the Flash files from the "Media"-tab in the "Page Info" menu (cmd-I). These links are hard to get to. FireFox's Page Info (in the Tools menu) is good for digging out these links from web pages. In Safari look in the Window menu, and pick Activity. This will show links to everything on the pages you have open. Prince of Persia (475 kB promotional) - hold the alt-key down when clicking this link to download instead of opening in the browser.